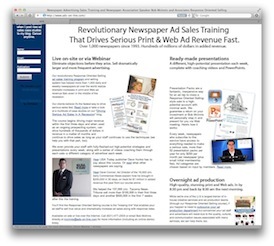 Driving Serious Newspaper Ad Sales: For a limited time, get the newspaper industry's most popular new hires ad sales course for a steal! For a limited time, get the newspaper industry's most popular new hires ad sales course for a steal! Get two years of unlimited access now for your entire staff for only $395. Next week, it'll be in the learning management system and will instead have a per-ad-rep price of $219. Same great content both ways, but you'll save a bundle this week. As you may know, we not only offer a live ad sales course called Response Oriented Selling, but we also have a Web-based, self-paced course specifically designed to help your new hires get productive fast. 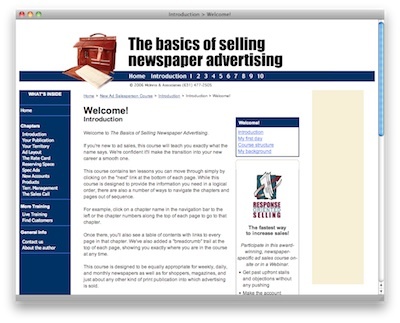 It's called Everything You Need To Know To Start Selling Newspaper Advertising Tomorrow and is a 144-page course designed to turn your completely inexperienced new hires into seasoned ad reps in just a day or two. 100's of newspapers in the U.S. and Canada already swear by it, including many of the larger groups. Beginning next week, this new hires course will be placed in a state-of-the-art learning management system, and while well worth it, the rates are going to increase dramatically. So, before we make the change, we wanted to give our blog readers one more opportunity to slip in under the existing price structure. And to sweeten the deal, we're going to give you another $100 off! Right now, your newspaper can license the new hires course for two years for an unlimited number of participants for $395 (including discount). Every new hire you bring on in the next 24 months can go through it for this one-time fee. But if you wait until the course is released within our new learning management system, the fee will be $219 per ad rep. It's still going to be a bargain, considering how much it helps an ad rep to quickly stabilize their new territory and start producing significant revenue fast. But by acting now, you'll get unlimited use of the same up-to-date course for dramatically less than if you put each ad rep through the learning management system individually. Proven effective and in use by hundreds of newspapers in the U.S. and Canada, you'll easily recoup your investment on your first new hire's first couple of presentations and certainly gain thousands of dollars of revenue that otherwise would be lost as your new ad reps learn the ropes. Even if you already have an excellent in-house new hires training program, for this kind of money, it's a great backup in case you're having one of those weeks where you don't have a minute to spare. Some newspapers even have their new hires go through this course before their first day on the job so they really hit the ground running. Read more about the course and to purchase and get the special $395 rate, enter your credit card information on our ordering page. This offer will be up until early next week.